A pastor who is a trained pianist discovered that he did not have to choose between jazz and Jesus -- and that the spiritual power of the creative, improvisational art form can be a tool to help his congregation experience God. People fill each pew as the Rev. Bill Carter takes his seat at the piano. As the man known for both his sermons and his music begins to play, members of his congregation tap their feet, clap their hands and snap their fingers. It’s time to worship God. At First Presbyterian Church of Clarks Summit, Pennsylvania, jazz music empowers. It breaks through isolation, leads to reflection and encourages a spirit of community. For the last 23 years, Carter has organized a yearly jazz communion on the Sunday before Labor Day, bringing his jazz band, his congregation and visitors together. Now the nationally recognized jazz ministry is expanding to offer four jazz vespers services in the next year as a way to explore the powers of music and healing. 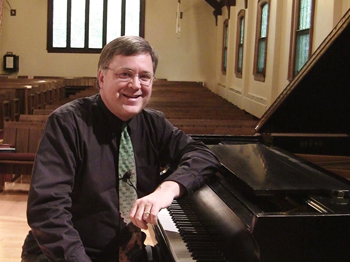 Like many churches, First Presbyterian has rich music offerings. But for many in the congregation, the jazz ministry holds particular power. “I’ve always loved music in church,” said member Judy Cutler, who sings in the choir. Carter’s parents signed him up as a young teenager for piano lessons. He didn’t immediately fall in love. It wasn’t until he listened to ragtime music and was introduced by his grandmother to the music of jazz pianist Dave Brubeck that Carter’s feelings changed. “Music went from something externally imposed to something internally driven,” he said. able to integrate the two. He started to write his own music, and by the time he went to college, he played in a band every weekend. He continued to play while at Binghamton University, where he switched his major from pre-med to philosophy after several profound spiritual moments changed his path. He needed to make up credits, so his music professor gave him an independent study to compose big band arrangements. He played jazz gigs on Saturday nights and sat in a church pew on Sunday mornings. Soon, he headed to Princeton Theological Seminary, his car packed with clothes and his electric piano. But the piano would be just for fun, he thought. His purpose was to work with and inspire faith within congregations -- not play music for them. He thought he had to choose between jazz and Jesus. He soon learned he was wrong. In 1990, Carter gave his candidating sermon at First Presbyterian. The church’s search committee had learned not only that Carter was an excellent teacher of the word of God but that he was an accomplished musician as well. At the end of the sermon, a man in the back row stood up and spoke. Carter preaches at First Presbyterian Church. “We’ve heard you preach, but now we want to hear you play something,” the man said. So Carter sat down at the piano and played. He got the job. The church released a short event notice that garnered coverage from the local newspaper and television stations. Accompanied by a singer from the choir, Carter played the piano for the service. It was music like the church had never experienced. Within a year, Carter, together with the music professor who had given him his independent study, formed the group Presbybop Quartet. 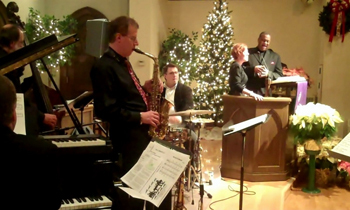 With Carter as pianist and his professor Al Hamme as saxophonist, along with a bassist and a drummer, the group explored the link between jazz and faith. Presbybop now plays regularly at First Presbyterian and has played at churches across the country. With the popularity of that first service, Carter began looking at jazz and faith in a new way. He started to think about church leadership through the lens of a musician. He felt energized. So did his congregation. He writes his own spiritual jazz and rewrites the music to traditional hymns. As he began to play jazz in church, he realized how much the music was reaching people. After people left church, they perhaps forgot the details of his sermons, but they did not forget how they felt when they heard the music. The music became another tool to reach his congregation. 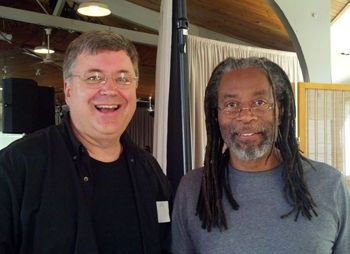 Carter with 10-time Grammy Award winner Bobby McFerrin. He understood that the contagious rhythm of jazz has a rejuvenating power, and the rich harmonies and chords can invite interior exploration. A single note can provoke an emotion. But more than that, he found that the communal form of jazz can lead to the sharing of passions and pain. An artist creates a sculpture alone; a painter uses a brush in isolation. But jazz forms a community, where the Spirit’s presence can be felt, he said. The “honest music” of jazz is made for the beauty of God. It gives people permission to be creative and gives them an opportunity to open up their souls, he said. “It’s about spending time thinking about possibilities rather than about limitations,” he said. As many churches in northeast Pennsylvania and across the country struggle with declining membership, the numbers remain steady at First Presbyterian. With 535 adult members, it is the largest Presbyterian church in the region. Carter attributes that to more than just the music; First Presbyterian is a strong faith community that makes an impact outside its walls each day. But the jazz ministry often attracts people to the church and has encouraged members of the congregation to offer their own artistic gifts. The church created a performing arts series and hosts concerts and art shows as a gift to the community. A local music school holds piano classes at the church. Creative gifts are from God, Carter said, and the arts events offer people a way to showcase their gifts and honor God in return. The church still has a music director and a traditional choir that sings traditional hymns. A teen choir and bell choir also perform, and jazz is not always a part of worship, but jazz services punctuate the church year. Along with playing the Sunday before Labor Day each year, Presbybop performs during an 11 p.m. Christmas Eve service. The first year of that service 15 years ago, some two dozen people attended. Now there are at least 150 people in the pews that night. A Mardi Gras jazz service is also well-attended. 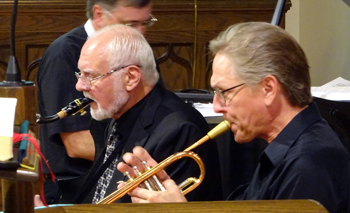 The jazz music complements the church’s more traditional musical offerings and has become an integral part of the congregation, said Susan Kelly, the director of music. While the jazz ministry has become more popular at church, it’s also brought recognition to Presbybop. Hamme, who plays the saxophone, said he appreciates seeing his former music student “grow up and be successful.” He also appreciates the impact their music has on the people who listen to it. First Presbyterian now seeks to further explore the power of jazz by developing a liturgy of healing. The congregation was one of seven from across the country that was selected to attend the Yale Institute of Sacred Music’s 2014 Congregations Project Summer Seminar, where they began intensive work on the program. The project, which includes four upcoming jazz vespers services, will look at issues of human pain and brokenness and the need for healing and forgiveness. Jazz originated in experiences of brokenness and oppression, Carter said, and is the perfect kind of music to provoke reflection. 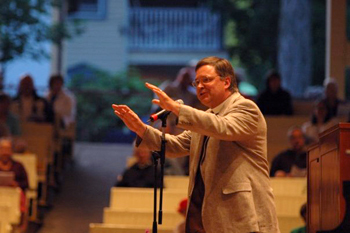 Many churches have jazz music, but what makes First Presbyterian unique is that the pastor is in charge of it, said Glen Segger, the coordinator of the Congregations Project at the Yale Institute. Members of the church say the jazz music brings energy to both the services and the congregation. Brian Schillinger, a 28-year member of the church, said the music “livens things up” and provides a different perspective on what pastors or ministers do. Carter’s music helps make people feel welcome, Schillinger said. “It demonstrates to the people coming in that it’s a place that is open,” he said. Jazz does not replace sermons but instead helps worshippers take a different approach to church, said Chris Norton, who sat on the church’s search committee when Carter was chosen. “It’s a fun, uplifting, different kind of worship,” he said. The music has also brought attention to the church and has encouraged new visitors to become members. At last month’s jazz communion, members of Presbybop and guest musicians performed music by both Carter and Horace Silver, the legendary pianist and composer. About 200 people attended the communion, which served as the weekly Sunday service. Presbybop members play at the jazz communion. Presbybop played two songs for the service’s postlude: “Brent’s Beadle” by Carter and “Filthy McNasty” by Silver. As the musicians took a final bow, the congregation gave them a standing ovation. During his sermon, Carter had preached about Moses and the burning bush. For Carter, that is playing music and leading his church in worship, whether it’s through sermons or prayer or jazz. What is the role of music in your church’s worship service? How might it be re-imagined? How is jazz uniquely situated to prompt reflection on the Christian message? What other art forms present similar possibilities? Carter weaves Jesus and jazz with passion and skill. How might Christian leaders inspire others to weave together unique faith practices in the same way? Beyond increased attendance, what can attention to the creative arts bring to a church? “Charis-Kairos (The Tears of Christ).” Taken from “The Four Holy Gospels,” illuminated by Makoto Fujimura, © 2011. Used by permission of Crossway, a publishing ministry of Good News Publishers, Wheaton, Ill.